MONTREAL – Resolute Forest Products is suspending indefinitely its wood-cutting operations in Quebec’s Mauricie region near Trois-Rivieres. The suspension, which starts Friday, will affect at least 180 jobs. 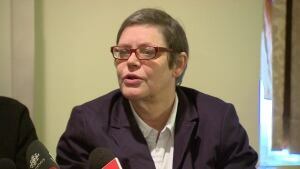 The Montreal-based company attributed the decision mainly to high fibre costs, but also low market selling prices. Spokesman Karl Blackburn says the decision won’t have an immediate impact on an area sawmill that employs 135. However, that situation could change in the coming weeks once stockpiles are used up. Metsä Wood of Finland makes quality wood products from local forest sources. It is working with internationally known architect Michael Green to promote its Plan B campaign, which seeks to educate other architects and designers that wood should always be considered as a serious construction option. Green especially likes to re-imagine existing buildings like the Empire State Building and the Coliseum. Wood is more sustainable with lower emissions than traditional building materials. It was refreshing to spend a day in the company of members of the British Columbia Wildlife Federation (BCWF) where the bulk of the agenda was about conservation and issues that really matter to fishers and hunters in this richly endowed province of British Columbia. The Nov. 22 meeting in Parksville was attended by over 30 representatives from throughout Vancouver Island. Members of “fish and game clubs” have a long history of connecting with the needs of wildlife and nature. This was clearly illustrated by Ted Brookman’s inland fisheries report. ….Dave Parenteau, Chairperson for Region 1, and also chair of the Tidal Waters Committee gave an exhaustive report of the regions correspondence since the last region meeting in May. There were no fewer than 40 pieces of correspondence reported on with informative one line explanations on the contents – well done. A Strathcona Regional District director is still in limbo, waiting to hear whether or not he will be reinstated to the forestry board he was told he is no longer welcome on. Area A Director Gerald Whalley said he and the regional district’s CAO met with staff from Western Forest Products on Friday, Nov. 13. 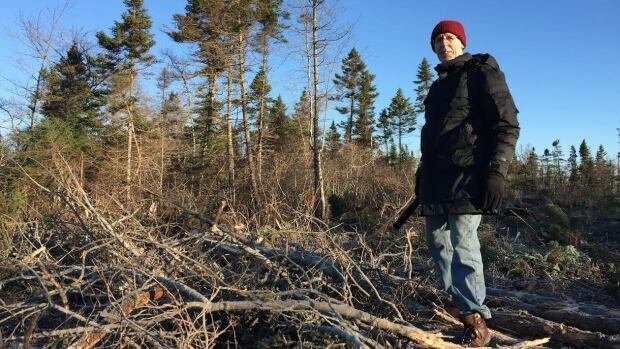 Whalley said Western, which hosts the Mid Island Forestry Lands Advisory Group (MIFLAG) meetings at its Menzies forestry office, said after hearing from Whalley it would take his comments “under advisement” and come back with a decision. Whalley has not attended a MIFLAG meeting since Sept. 22 when he was told to leave the Menzies forestry office and not come back. For David Suzuki to suggest that our country invest infrastructure monies in trees is good for climate and urban health is distorting and manipulating some basic truths. …But let’s focus on some “true” information that most folks likely would not think about and certainly wasn’t mentioned by Suzuki. Most municipalities take great care to provide a pleasing natural environment (greening and green spaces) within their urban areas; the nature of the Suzuki article suggests that our municipalities are not doing enough and should do more. I would sincerely disagree. FREDERICTON — A broad range of public interest groups and experts in New Brunswick says new legislation is needed to ensure our public forests are being managed to meet the needs of all New Brunswickers. 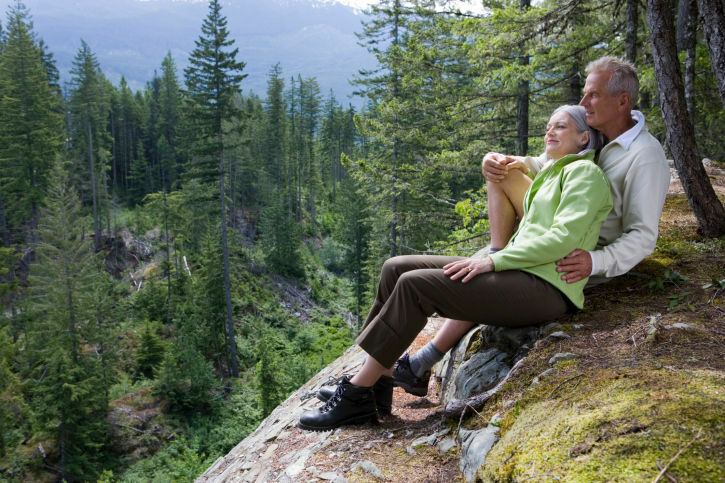 The group, which includes representatives from wildlife organizations, the scientific community, private woodlot owners, environmental and conservation organizations, is calling for the urgent development of a new Crown Lands and Forests Act. 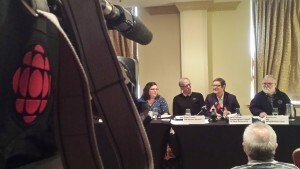 In a statement sent to the provincial government today, the group says the existing act, which came into law in 1980, fosters an outdated approach to forest management and fails to reflect the interests of the whole province. Forest management has become more complex, and New Brunswickers now expect forests to be managed for water, wildlife, recreation and other uses as well as jobs and revenue. JUNEAU — The Tongass National Forest has withdrawn a proposed timber sale near Petersburg that could have provided 30 million board feet of timber to the Southeast logging industry. Local environmental groups that had opposed the sale are praising the decision, and are claiming a victory. But the U.S. Forest Service said it canceled the sale due to “industry concerns,” and plans to bring a revised sale back later. The cancelation of the sale will mean more deer available for local hunters on Mitkof Island, where the sale was to have been held, said Becky Knight of Petersburg, with the Greater Southeast Alaska Conservation Community. During this season of Thanksgiving we give thanks for the forest and for all who cherish it. We offer gratitude to those who derive their livelihoods from the forest via their stewardship and care. We appreciate their devotion and skill to protect the forest’s integrity while using the forest so we might all share in its bounty, whether this be wood to build our houses, clean water to fill our rivers or wild places to restore our souls. …Those who participate in forest collaborative efforts tread this new path, one that respects divergent interests and works to sort out constructive manifestations of common purpose. Based on their willingness to listen, these collections of our fellow Montanans frequently create original approaches for forest management, tailored to the unique conditions confronting the land and the surrounding communities. Over the next several years, the more than 200 trees that were planted on the road on Saturday, Nov. 21, will begin reclaiming the barren space for the Mt. Hood National Forest. Previously used for logging, Forest Service Road 111 was decommissioned by the federal agency in July 2015. 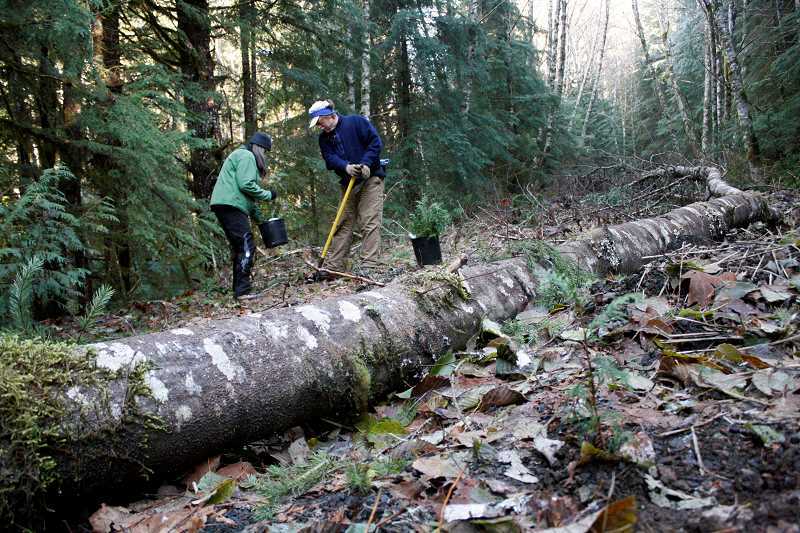 Because of its proximity to Lost Creek, which is habitat for Coho salmon and steelhead trout, and the danger of its unmaintained culverts, the road was prioritized for Zigzag Ranger District’s ongoing decommissioning program. Zigzag District Ranger Bill Westbrook said roads are decommissioned as funds become available and with priority to immediate threats to nearby wildlife habitat. Idaho’s Department of Lands has shifted into high gear for salvage timber sales after this summer’s devastating forest wildfires, state Lands Director Tom Schultz told the Land Board today, putting together and marketing salvage timber sales for 83.5 million board feet of timber – roughly 33 percent of the typical volume for a year – in just six weeks. It was “pretty incredible work,” Schultz said. Eleven of the sales, consisting of 58.3 million board feet, have been sold so far; once logged, they’ll bring in $13.8 million for schools, which are the main beneficiaries of the state endowment. Four more sales still are in the works. An interpretation of rules governing conservation payments will prove costly to an Oregon producer. MONMOUTH, Ore. – When Bob Lamb talks about the conservation program he implemented on his property, he does so with reverence. The work, he said — planting 25,000 trees, improving water quality in the Little Luckiamute River, seeing lamprey return to spawn, learning of the complicated relationship of plant and soil — was about more than himself and his time. It wasn’t about the money, either, although he welcomed the $220 per acre paid him annually under the Oregon Conservation Reserve Enhancement Program (CREP) administered by the state and the USDA’s Farm Service Agency. That’s why it’s so demoralizing to learn, as Lamb renewed the CREP agreement for another 15 years, that he will be paid a lower rate per acre. The Cougar Creek Burn was by no stretch of the imagination the Northwest’s worst fire last year. But for Portlanders, it hit close to home. The Friends of Mount Adams will host a panel discussion Dec. 11 to look back at the burn’s affect on the landscape, and forward to how land managers hope to clean up the aftermath and prevent future blazes from happening. The talk, Mt. Adams Cougar Creek Burn: The Future, is scheduled for 7 p.m. at Columbia High School in White Salmon, Washington. The panel will include federal and state land managers and scientists, members of the Yakama Nation, and outside experts. The fire struck Aug. 11, a result of lightning. Over a period of more than a month, it ate away 54,000 acres before firefighters extinguished the final flames. As an Alaskan, I am flattered this year’s Capitol Christmas tree comes from our own Chugach National Forest. Selected by the U.S. Forest Service for its perfect, conical shape and evenly dispersed branches, the 74-foot Lutz spruce is a statuesque symbol, for sure. But it symbolizes much more than holiday cheer. The handsome tree on the West Lawn was cut, ironically, from a forest that bans timber harvest. That’s due to the roadless rule, which prohibits construction of new roads in harvest areas and makes most federal land inaccessible to a timber industry that, like our other responsible resource industries, helped build infrastructure and industry in our state. Multiple fire companies have contained a forest fire in the Blue Mountain area of Lehigh Township. The first call for a forest fire in the area of the intersection of routes 145 and 248 came in at about 2:11 p.m., according to Northampton County dispatchers. In all, the blaze drew ten fire companies to the scene. It was contained at about 3:45 p.m. No structures were involved. As of 4 p.m. fire companies remained at the scene to extinguish the flames. A large forest fire in Marlborough is still burning fiercely, firefighters say – with its cost predicted to be at least $3 million. Helicopters with monsoon buckets were still working in rotation to contain the fire this afternoon, with a large number of ground crews assisting the effort. Marlborough Principal Rural Fire Officer Richard McNamara said the fire was very aggressive, moving swiftly through forestry harvest debris, mature pine trees and some native scrub in the Waikakaho Valley, north-west of Blenheim. The fire had threatened several properties but losses had so far been confined to timber, vehicles and forestry equipment, he said. He estimated property losses would be worth between $2m and $3m, with firefighting costs likely to be over $1m. The hot, dry winds plaguing the South Island for the past few days have cut power, ripped the roof off a grandstand and hampered flights. Choppers fighting South Island blazes, which were grounded due to wild winds, resumed work on Friday afternoon. But gales in the capital were gusting up to 144kmh, and grounding or delaying flights. The wild weather also whipped up a forest fire in Wairarapa, where seven helicopters were battling the blaze. Helicopters were again tackling the 400-hectare Waikakaho Valley fire, north of Blenheim, on Friday after being grounded by strong winds. Prime Minister Justin Trudeau met with Canadian premiers and top climate scientists from across the country Nov. 23 to develop a strategy and cohesive position that Canada will take to the upcoming United Nations Climate Change Conference in Paris. The political symbolism of this meeting cannot be overstated. …The Forest Products Association of Canada (FPAC) strongly believes that Canada has an opportunity to establish itself as a world leader on climate change. As a resource and manufacturing industry that directly supports 230,000 well paid jobs across Canada and is a world leader in green, sustainable forest practices, we believe that no other sector is better positioned to help advance Canada’s climate goals and establish itself as a world leader in that field. Wood pellets become more and more popular all over the world in terms of renewable energy production. …the demand for this kind of biomass fuel is growing from year to year. However, not every country possesses appropriate resources to produce pellets. In this case, those countries, which possess huge forest areas, become the leader of this sector. …[Canada] occupies approximately 10 per cent of the world’s forest. This figure equates 397 million hectares. That is to say that the forest resources of Canada are the third largest in the world. In this case, Canada is one of the biggest wood pellets exporter in the world. What is more, this country was the first to produce pellets and utilize them in order to generate energy. Canadian production of wood pellets has significantly increased since 2000th. For instance, in 2002 Canada produced 500,000 tonnes of pellets. In 2011, this figure equated 3.2 million tonnes. 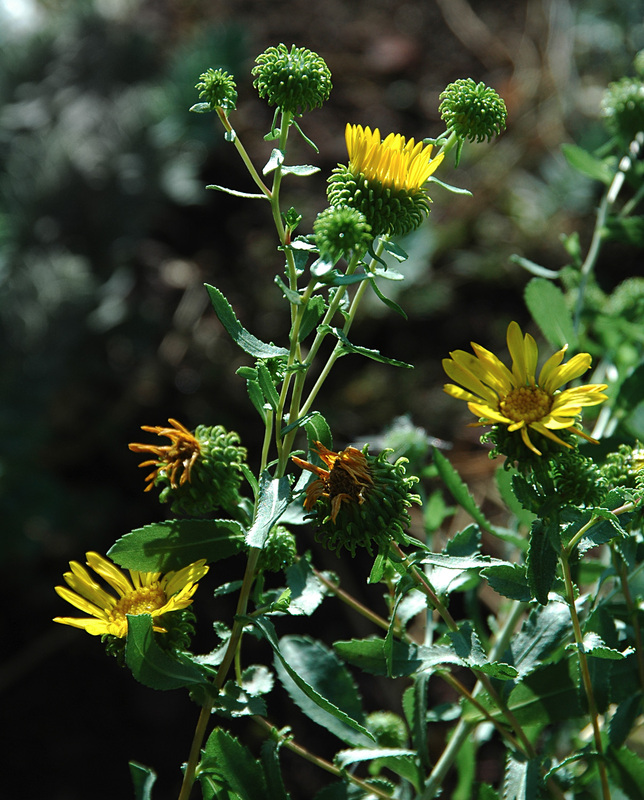 RENO, Nev. — Three decades ago, a University of Nevada researcher who obtained one of the first U.S. Energy Department grants to study the potential to turn plants into biofuels became convinced that a roadside weed — curly top gumweed — was growing along the road to the future. Now, scientists who’ve been cultivating gumweed on the Reno campus think they are on the verge of producing diesel fuel, and perhaps someday jet fuel, from the sticky cousin of the sunflower that grows across much of Nevada’s high desert and doesn’t compete for acreage with animal feed or food crops used to make ethanol. As we head into COP21, negotiators can look to California’s cap-and-trade programme as an example of how carbon markets can drive investment to support positive forest management. Forests are the largest source of offsets to the California market, with more than 60% of the system’s offsets originating from US forests. California allows businesses to meet up to 8% of their compliance obligations with eligible offsets, such as those from forestry projects in reforestation, improved forest management, and avoided conversion of natural forests. In less than three years, the California offset system has registered more than 3% of privately held timberland in the US.